All K4 to Grade 5 homeroom teachers are accountable for teaching and assessing the Common Core English curriculum of Language Arts and Math, as well as Science, Social Studies and the integration of technology. 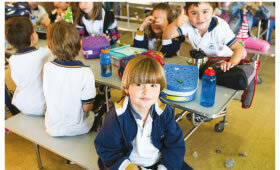 Additionally, all elementary students have weekly classes in Music, Art, Religion, Ethics and Values (REV), and Physical Education with specialist teachers. They also receive Spanish/Social Studies classes 5 times per week. 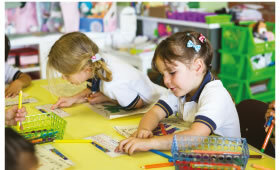 Our curriculum is based on standards and benchmarks, and units for each subject and grade. We review and revise annually to ensure that a meaningful and coherent scope and sequence of skills, concepts, knowledge and attitudes are systematically being taught and assessed. Curriculum maps, developed by teachers at each grade level, identify themes and units taught and teacher teams are continually refining unit plans. Teachers employ a “backwards-design planning” model.